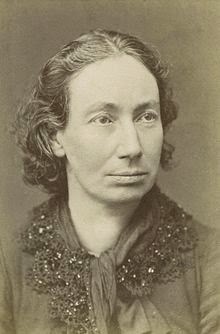 'Louise Michel (1830-1905) was a celebrated figure in 19th century French politics, an anarchist who fought at the barricades in the Paris Commune of 1871 and was subsequently exiled to New Caledonia. Returning to France in 1880 she was frequently in conflict with the authorities, and decided to flee France for London in July 1890, shortly after being arrested following May Day riots'. According to Edith Thomas's biography, Louise Michel lived at one point at '79 Arspley Terrace' in East Dulwich, an address I have never been able to find, but I now think may have been an error. I believe that Louise Michel's first visit to London was in 1880. After being released from New Caledonia, a French colony in the Pacific, she and other amnestied Communards were taken to Sydney, Australia, from where they travelled on the mail ship 'John Helder' to London. As the ship waited in the fog in the Thames Estuary to be guided to port, French exiles in London made their way to greet it in small boats, singing Communard songs to their comrades (Butterworth, 2011, p.62). On this occasion, Michel only stayed for a couple of days before returning to Paris, but she mentions that with her friends she smuggled five cats from Nouméa (capital of New Caledonia) 'down the gangplank in London' and that 'Once in London, in front of a fire, with an enormous bowl of milk my friends brought them, they began to stretch out, yawning' (Michel was a big animal lover). She did flee to London in 1890 and apparently stayed here until she returned to Paris in 1895, but she continued to spend time living in London on and off until her death in 1905. She definitely lived for some of the earlier period at 59 Charlotte Street, Fitzroy Square - an area where many radical refugees hung out. The earliest reference I have to a definite address n East Dulwich is from August 1894, when Louise Michel sent a letter to the artist Lucien Pissarro (son of Camille) from '15 Ardley Terrace, East Dulwich' (this letter is in Ashmolean Museum collection). There is also the envelope of a letter written to her here in July 1898. 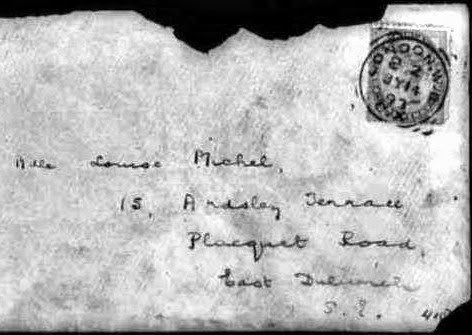 People do make mistakes when writing addresses which causes problems for later historians! This one does read more like Ardsley, and I wonder the 'Arpsley Terrace' false trail might have arisen from copying such a mistake. There were only 20 houses in Placquett Road, and the Victorian houses there all seem to be still standing, including presumably the one Louise Michel lived in. But of course they have all been renumbered and I couldn't see any reference to Ardley in the house names. If anybody can work out which house was 15 Ardley Terrace I will buy them a drink! 25 Chesterfield Grove, East Dulwich. Thomas also states that Michel moved again in March 1900 to 'to join Charlotte's father at 8 Albion Villas Road, Sydenham'. 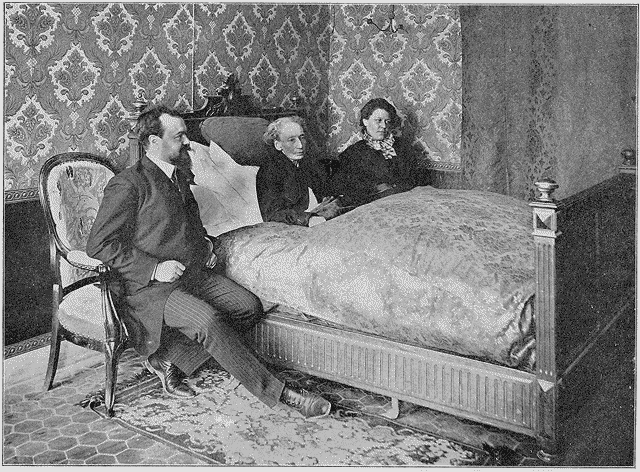 Charlotte Vauvelle was Michel's long term nurse and companion, and her father was Auguste Vauvelle. The 1901 Census for 8 Albion Villas lists Auguste, Charlotte and her brother Achille, with Louise Michel as 'boarder' described as 'authoress. Achille Vauvelle is listed as a 'Chromo artist' (i.e. chromo-lithographic printer) - he later worked with Waddingtons. Finally the archive has some letters sent to Louise Michel at another address in December 1903, 53 Dahomey Street, Mitcham Lane. Here's a flyer form October 1896 for a meeting of 'London Anarchist Communists' to 'bid farewell to Louise Michel and Pietro Gori on their departure to America on a lecturing tour' (Gori was an Italian anarchist poet). The meeting at the Club & Institute Union Hall in Holborn also featured the prominent anarchists Errico Malatesta and Sebastian Faure, as well as Tom Mann (later of Brockley), one of the leaders of the 1889 dock strike in London. Speaking to some friends at the Radical Bookfair at the Bishopsgate Institute last weekend, we came up with the idea of doing something over the summer to mark Louise Michel's time in the area, possibly linked to some kind of Sydenham/Forest Hill radical history walk finishing with a picnic and some Communard songs. Let us know in comments or by email if you're interested. Butterworth, A. (2011), The World That Never Was: A True Story of Dreamers, Schemers, Anarchists and Secret Agents, London: Random House,p.62. Michel, L. (1981), The Red Virgin: memoirs of Louise Michel, Alabama: University of Alabama Press. Thomas, E. (1980), Louise Michel, Montreal: Black Rose Books, 1980. A fantastic post, and I'm fully supportive of the event mentioned at the end. Who should I email with my details? Vive la Révolution, Albion Villas Road! Paul Mason talks to Matthew Parris! on his admiration for her life and political struggle..
top piece of research - look forward to the summer event. Speakers line-up in the flyer don't look half bad does it. Any idea which workhouse in Lambeth she visited? The local choir, The Strawberry Thieves, sing a song attributed to Louise Michele, "Danse des Bombes"
Yes Brian/Ruinist, that was my source and it doesn't say anymore than it was in Lambeth. There is a Historical google map you could try. This was brought to my attention as I live opposite the property in Chesterfield Grove. With regards to the house on Copleston Road, I think the ones at that end of the road have the "All's Well" motto of the old Camberwell Borough which itself, I believe, dates from 1900? Anyway, the link below would suggest that the properties in what was the Placquett Road might have been demolished and rebuilt in their current form circa 1903 - so after Louise Michel would have lived there? This is great – thanks so much for taking the time! Seems like she's referring to 1899/1900. I wondered if you knew anything of LM's relationship to animals and if there's anything on this particularly relating to her life in London also?